The mechanic’s bag of rags has a replacement. TIDDOX's SOLVENT RESISTANT AUTOMOTIVE WIPES are far better, more durable, and more absorbent than the recycled t-shirt rags commonly used. And perhaps the best part is, they are hygienic, consistent in size, and easier to transport and store! One of the best parts of reclaimed T-shirt rags is that they are rough textured. This means you can use them to scrub up messes. 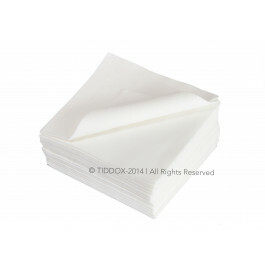 But, our solvent resistant car cloths have two sides – one is abrasive for use when scrubbing grime and dirt. The other side is soft, with low-lint. This makes them the perfect choice for clean-up. Its versatility means that you can rub fingerprints off of the paint, shine mirrors, and clean your tools with this towel, then throw it away. It is made with wood pulp and polyester, so the fibers are strong and absorbent. Don’t worry about that radiator leak – just drop a few of these towels on it and they will soak up the mess until you can get back to it. You don’t have to worry about the mechanics cloths dripping on the way to the trash can, making a bigger mess or smearing gunk instead of absorbing it. They are solvent resistant, which means they won’t come apart as soon as they get saturated with brake fluid, and they are viscous enough to absorb oil and grip grease. Order a few cartons today! You’ll get 6 packages of 50 mechanic wipes each, and can place them in each bay of your garage. You won’t want any other automotive towel in your shop!